When the explorer George Mallory was asked in 1923 why he wanted to climb Mount Everest, his succinct answer – “Because it’s there” – has gone down in the annals of great quotes explaining the human condition. 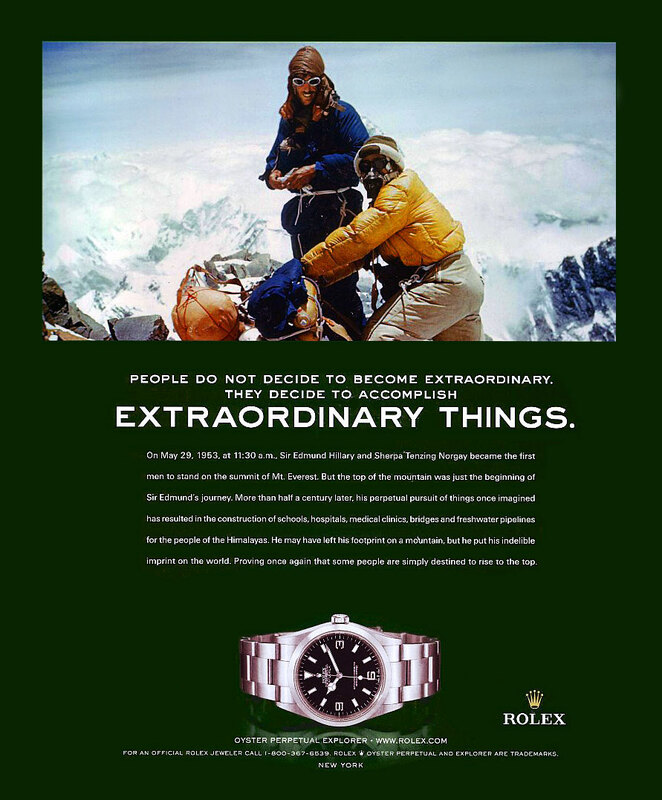 When Everest was finally conquered 30 years later, members of the exhibition party were wearing Rolex Oyster watches. 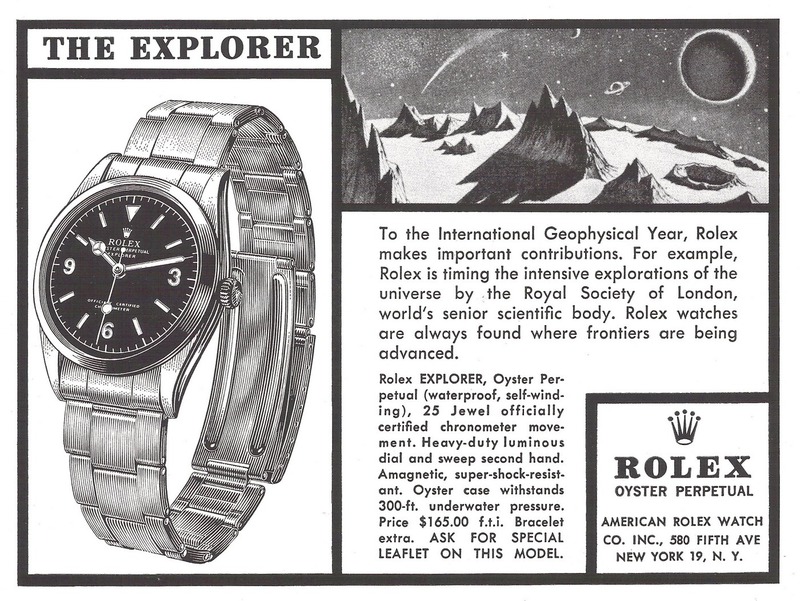 Shortly afterwards Rolex launched the iconic ‘Explorer’ model. The Rolex Explorer was launched in 1953, based around another iconic Rolex model; the ‘Bubbleback’. The Bubbleback grew out of Rolex’s development of self-winding movements. The addition of an oscillation weight increased the size of the movement, meaning it would no longer fit in the standard Oyster case. Instead of changing the casing size, Rolex extended the back of the watch which became dome-shaped, giving the watch the affectionate ‘Bubbleback’ nickname. The tough and robust reputation of these watches made them the perfect ‘tool’ to use when Rolex began developing the Explorer. Prototypes began field testing by mountaineers in 1952, where the watch would accompany the wearer to the limits of their own capabilities. Sherpa Tenzing Norgay wore one of these prototype’s when making the first successful ascent of Mount Everest on the 29th May 1953 proof, if needed, that this new addition to the Rolex family fulfilled its brief as a true explorer’s watch. The Explorer model 1016 was launched in 1959. Originally featuring a gloss black dial, it was the first Explorer to be marked ‘Superlative Chronometer Officially Certified’ on the dial, and was also the first to feature minute marks which went to the very edge of the dial. The 1016 remained in production until 1989, making it the longest continually made Rolex model. 1971 saw the launch of the Explorer II 1655. The development of the watch led to the introduction of a metal bezel with a 24-hour time scale as well as a second hour hand. These additions further developed the ‘tool’ nature of the Explorer, as well as its practicality. The second hour hand allowed the wearer to keep constant track of daylight hours remaining, leading to its use in the field of Speleology, the scientific study of caves. A new model Explorer II, the 16550 was launched in 1985 which included, for the first time, a white dial. With the addition also of white hands, and the model’s close association with adventurers and explorer’s, this set-up quickly gained the nickname ‘Polar’ reflecting its almost pure white appearance. The white dial remains a popular choice with the newer model Explorer II’s. The most recent model, the 216570, saw the Explorer II move to a larger 42mm case and a return to the iconic orange ‘arrow’ second hour hand, which was a striking feature of the original 1971 Explorer II. The original Explorer 214270 remains a popular watch in its own right and is currently available in a 39mm sized case. In his introduction to Mallory’s 1921 book ‘Mount Everest the reconnaissance’; Sir Francis Younghusband, Chairman of the Mount Everest Committee, observes ‘The higher climbers climb, the higher they want to climb’. This quest to constantly go beyond what is thought possible has driven gifted people to push the boundaries and accomplish feats which were thought impossible. Rolex shares this admirable quality which has seen the company produce timepieces that define era’s and redefine the art of watchmaking. The Explorer is firmly ensconced as an iconic model, and shows that necessity really is the mother of invention.